The principal role of chymosin or other enzymes in rennets is to destabilize the casein micelle and thus cause the gelation of milk, but a small amount of coagulant is retained in the cheese curds and contributes to the ripening of many cheese varieties. The level of coagulant retained in cheese curd depends on several factors related to the milk or the procedure of cheese manufacture, e.g., concentration of the caseins in milk, ratio of different caseins, casein micelle size, ionic strength of milk, heat treatment of milk, extent of acidification of milk prior to addition of rennet, pH at whey drainage, cooking temperature, level of moisture and cheese age. The quantity of rennet retained in cheese curd also varies with the type and ratio of enzymes in the rennet, their stability to pH and temperature during cheesemaking and the influence of pH on their ability to bind to the caseins. 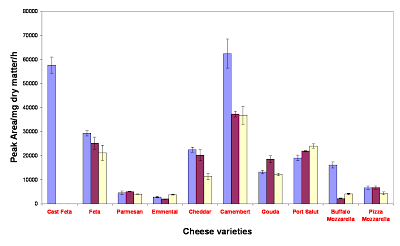 Because of these factors, the amount of residual rennet activity in cheese differs between varieties (expressed in the graph above as peak area units/mg dry matter/h and determined by HPLC on a synthetic substrate). Low levels of residual chymosin are found in cheeses which are cooked to high temperatures (e.g., Parmesan and Emmental) and in pasta-filata cheeses, the curds for which are heated and stretched after acidification. Camembert contains relatively high amounts of residual rennet activity as it has a high moisture content, little or no cooking and, significantly, syneresis is driven by acidification which means that much whey drains at low pH values encouraging retention of rennet. It is interesting to compare levels of residual rennet in Feta and Cast Feta; the latter cheese is made from milk pre-concentrated by ultrafiltration and so there is little or no whey drainage during manufacture and thus little or no loss of rennet.